Coming up with a release that would top a previous is never an easy task. No matter the experience involved, it can go either way. That is probably the reason why the phenomenon is rather rare. Two years following the release of “Denim And Leather”, SAXON were still on the high horse, being one of the top in NWOBHM, and in Metal music in general. In fact, NWOBHM’s golden age was coming to close even though some of the greatest releases of British Metal were out in the market that year such as IRON MAIDEN’s “Piece Of Mind”, SATAN’s “Court In Act”, DEF LEPPARD’s “Pyromania”, SAVAGE’s “Loose N’ Lethal” and the list goes on. 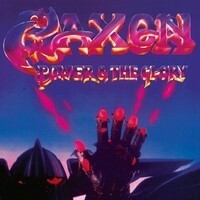 SAXON’s contribution to this amazing wave of albums was “Power & The Glory”, which sealed it in stone that horizons have no limit when it comes to SAXON. Being part of the latest reissue run by BMG Music, “Power & The Glory” comes next in line. Delivered in high quality book type package, similar to “Denim And Leather”, which consists of numerous photographs and posters surrounding the period in SAXON’s career. Furthermore, the listener has the chance to check earlier year’s demos and well produced recordings of several songs of the album joint with tunes that were decided to be left out of the official release. Honestly, at least one of them made me question a bit the band’s, or label’s, original decision of not to be included within the release. However, let the past be the past I guess, normally it comes back to haunt. Of what I could think of that made a difference in “Power & The Glory”, in contrast to SAXON’s earlier releases, is my interpretation that this album was one of their heavier outputs in the 80s. One of the indications to that particular notion, other than the production that added additional robustness to the music, was the less Boogie Rock styled mannerism within the riffs and beats while attributing to the Heavy Metal form that became the band’s prime signature. The songwriting is still fundamental and by the book based, an aspect that never really did leave SAXON in their ongoing heritage and it went well with the intense hook-laden musical approach of blue collar meets epic Heavy Metal. The overall experience out of the end result is enriching, delightful to listen and even though less anthem driven, it is still unforgettable. Furthermore, I honestly believe that the introduction of Nigel Glocker to man the skins, a role that he still holds, influenced somewhat on the band’s rhythm section’s diversity and technique, a sure upgrade to the material. Surging right into the hot pit of “Power & The Glory”, the well reserved barrage of purified Heavy Metal continues. “Midas Touch” haunted me with a main riff of solid gold, a mindblower, so direct and to the point, driving the wheel of the song along with the soft chorus filled bursts. I couldn’t stop headbanging to the beat. It is also yet another proof that other than mustering tasty riffery and touchy lead guitar work, SAXON have the ability to come up with lyrical concepts that are rich, easy to comprehend and of course well put into play. What can you expect with such a voice such as Byford’s? Shame, shame, shame that a song like “Make Em Rock” didn’t make it to the official tracklist. It is Heavy Metal thunder alright, SAXON at their prime heaviness, tough street gang Heavy Metal, delivering a massive blow in the name of the good of British Metal. “Power And The Glory” is a continuance of the line of accessible straightforwardness, without zealous technical prowess, SAXON inflict energetic determination with a decisive anthem, once again another a form of Metallic heaviness that is so pleasant to listen to. “Warrior” is a feverish attack of pure Heavy Metal nostalgia, without a doubt one of SAXON’s heaviest of efforts. On top of it, there is a fine line of melody of the renowned twin guitar power. I found the lyrics inspiring, catchy and rightfully fit the song’s blitz form. “Watching The Sky” serves as the album’s melodic tune, kind of Hard Rockin’ but with a heavy-duty edge, Byford’s amazing vocal performance is over the cliff while the soloing sections pour an electric storm all over the place. Certainly one of SAXON’s greatest moments in the early 80s, perfecting their solid steel formula of writing songs that are of the highest order in British Metal. Like any of their early discography, add this one to your list.